Released in 2001, Jak and Daxter is a 3D platformer for the PS2 set in a seamless world with enormous vistas and colorful, well-animated characters. 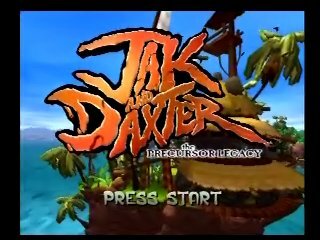 Jak embarks on a quest to reverse his best friend, Daxter's, transformation into a furry Ottsel and in the process you end up having to save the world from twisted minds wanting to unleash dark eco, the most dangerous element in the universe. Best time: Single-segment 1:23:44 by Stephan 'Freak4games' Toews on 2013-11-12. First off I'd like to thank the people from my stream chat. Though there may be few for now I want to thank them for hanging out with me during the countless bad runs that I do of this game. They are the reason I still run this. ZenicReverie for his run on this website. If it wasn't for that 1:40:11 of his I would have never started running this game. I'd also like to thank PrearDF, BillBraid, Rozerr, NT1_Evolution, and the rest of the Jak and Daxter speedrunning community. Without all of them I wouldn't have learned the strats and knocked down my time as much as I have over the last few months. It's been a rollercoaster of emotion getting my time to this, so it's good to see such a fast time. Before I even start a run I save time by making sure I turn off game hints. Now we get to sit through this cutscene. 6 minutes to do what you want. Whether it be a bathroom break, smoke break, food, whatever. I think I played bass guitar for the duration of this one. Ignore the random pauses throughout the gameplay I don't know why my game does that. The pause during the death at zepplin's was me debating for half a second about resetting but being as far ahead of my pb in the first place I kept going. Overall for me there is about a minute of easy time saving due to mistakes but I'm thinking of moving to 100% now that I subbed 1:24.